Best Villa Rental Agencies These days, many villa rental agencies double of museums, hands-on cooking classes, and more.These experts have you covered. From January 2014 By Brooke Porter Katz, Bree Sposato, Henle y Vasquez Appeared as "T+L's Guide to Villa Rentals" in T+L Magazine. ​This collection's 60 stylish properties (many of them affordable studios) are located in historic neighborhoods, primarily Île St.-Louis; most face courtyard gardens or shop-lined streets. * Standout: The balcony of the classically decorated Acacia overlooks the Seine with views of Notre Dame (studio; $2,457 a week). 33-1/44-07-06-20. Each of the 45 villas in Provence, Aquitaine, the Loire Valley, and Burgundy has a local host who will offer you insider tips on, say, the best places to eat or the ideal time to visit the local market. Agents are candid about what’s not shown in photos, such as nearby church bells that chime on the hour. * Standout: In a Provençal hilltop village, the four-story stone Bastide de Ventoux has wraparound terraces and an elevator (six bedrooms; $18,300 a week). 800/374-6637. The majority of Carolyn Grote’s 150 apartments, farmhouses, and châteaux are located in Paris, the Loire Valley, Provence, and the Riviera; she also has listings in Italy (Tuscany, Umbria, Lazio, the Veneto) and in Barcelona. * Standout: A farmhouse in St.-Rémy, France, has its own garden and is within walking distance of a charming market (four bedrooms; $3,814 a week). Most of Sarah Conway’s 32 apartments and houses are exclusive, and they’re located in some of the city’s best neighborhoods (Kensington, Notting Hill, Chelsea, and Mayfair, among others). The company’s regularly updated blog shares the team’s latest finds. * Standout: The sleek, white-and-beige Hornton House is situated on a bustling Kensington street (three bedrooms; $3,692 a week). 888/520-2087. All 62 Victorian manses, castles, and cozy cottages in England, Scotland, and Ireland are fully staffed. Agents are more than happy to help you arrange, say, a private tour of Althorp, the childhood home of Princess Diana. * Standout: Just 15 minutes north of Perth, the Scottish Tower of Lethendy, which dates back to 1570, is surrounded by 50 acres of gardens. The price includes all meals and a full bar for up to 16 people (eight bedrooms; $39,967 a week). 44-1835/824-642. The founder has personally inspected each of the company’s 342 manor houses, cottages, and apartments, which are scattered throughout the British countryside. The company also has a strong portfolio in Italy. * Standout: In England’s Cotswolds, the 17th-century, three-story Broadwell Farm sits on 280 working acres (five bedrooms; $2,779 a week). 207/622-0743. Adams & Butler: Siobhan Byrne-Learat’s team of 10 manages a private portfolio of 150 castles and houses owned by aristocracy throughout Ireland and has a knack for arranging excursions based on themes such as gardens or antiques. The company also has listings in Scotland, England, and Kenya. Standout: The 1780 Shanagarry House has a large kitchen and is located next to the famed Ballymaloe Cookery School, in County Cork (six bedrooms; $4,550 a week). 800/894-5712. Andalusia, Catalonia, the Basque Country, the Costa Brava, and Ibiza—Mary Vaira has scoured each destination to handpick this collection of haciendas, apartments, and castles (she also has several Italy listings). Coming soon: Butler at the Door, a service that will fully staff your villa upon request. * Standout: Masía Antonio manor, just a half-hour from Barcelona in Sitges, dates back 250 years and has a 1,700-square-foot swimming pool flanked by wooden lounge chairs (10 bedrooms; $9,000 a week). 800/474-5765. ​More than 300 properties—chic apartments in Madrid; Mediterranean-facing villas in Ibiza—are hidden away in the country’s most beautiful corners. Airport transfers and pre-arrival grocery shopping are standard, and each villa is attended by a property manager who lives nearby. * Standout: The classic Andalusian-style Carmen de los Moriscos, in Granada, looks directly on the Alhambra palace (three bedrooms; $2,520 a week). Most of the 83 ultra-stylish properties from this London-based firm are exclusives. The portfolio concentrates on countryside estates and high-design beach villas in France, Spain, Italy, and Portugal. Special experiences—such as a visit to Empress Sissi’s apartment in the Royal Palace of Venice—are the norm. * Standout: Villa Gesomino, set above Marina Piccola on Capri, has a heated pool lined with Murano-glass tiles (five bedrooms; $34,876 a week). 44-20/7788-7815. Countess Simonetta Brandolini d’Adda has more than 80 Italian villas on offer—many owned by her friends and relatives. She’ll also open up her little black book to guests for private experiences, such as behind-the-scenes access to the Palio di Siena horse race or a private tour of the Vatican. * Standout: The recently restored Casa Querceto, in Chianti between Florence and Siena, is surrounded by olive groves and five acres of hiking trails (four bedrooms; $14,000 a week). ​The company’s inventory of more than 65 countryside properties across Italy ranges from seaside estates to farmhouses. The concierge offers experiences such as a private dinner with Michelangelo’s David at the Accademia di Belle Arti museum. * Standout: A secluded retreat on the Tuscan coast, Villa Bianca has enormous bedrooms and a staff of five, including an on-site chef (eight bedrooms; $32,500 a week). 781/639-4040. The Byrne sisters have stayed in each of their collection’s 130 villas and apartments in Rome, Florence, Venice, and along the Amalfi Coast; most are set in historic districts or buildings. * Standout: The Rome Flaminio apartment, located an easy walk from the Spanish Steps, has a terrace (two bedrooms; $3,335 a week). 888/308-6123. The London-based company’s entire portfolio of more than 120 properties in Sicily and Puglia—set along the sea, in the countryside, and in town—is privately contracted. On-the-ground concierges and managers are available around the clock. The company recently expanded to the Ionian Islands, where it has 17 properties. * Standout: Baia dei Turchi, situated just north of Siracusa, has a Turkish bath and is a two-minute walk from the beach (seven bedrooms; $9,170 a week). 800/490-1107. Andrea Grisdale has intimate knowledge of each of her 86 listings, and works closely with owners to maintain quality control. More than 40 staff members are at the ready to arrange activities such as an aperitivo crawl through Venice in the company of a Venetian countess. * Standout: Villa dei Sogni, near the town of Bellagio, is on a lush promontory; the furnished terrace overlooks Lake Como (four bedrooms; $12,025 a week). 39-031/952-059. U.K.-based Croatian Villas has more than 350 beautiful houses set along the water and on hilltops all over the country, from Dubrovnik to the Istrian peninsula, which many travelers call the less-touristed (and more affordable) Tuscany. It also has listings in Slovenia, Montenegro, Bosnia, and Oman. * Standout: An apartment in the Old Town of Korčula with an ancient Roman column (one bedroom; $780 a week). Founder Graham Simpson’s mission is to deliver an authentic Turkish experience, whether that means eating fresh fish in Akyaka or sailing off the small seaside village of Çirali. Of the company’s 35 villas in Turkey, 90 percent are exclusive. Villas are also on offer in Greece, Corsica, Majorca, and Mauritius. * Standout: On the outskirts of Islamlar, the whitewashed Firefly sits on secluded Patara beach (four bedrooms; $6,720 a week). 44-20/8392-5858. Outstanding personal service is the hallmark of owner Maxine Harrison, who has been in the field for nearly 25 years. Meals are often waiting for clients upon arrival, and activities might include scuba diving off the Greek island of Sérifos, or a cooking lesson led by chef Pierluigi Gentilini of Il Mulino di San Michele, in Emilia Romagna. * Standout: In the Cyclades archipelago, the whitewashed Tzia Summer House has sea-facing balconies and an infinity pool (four bedrooms; $12,770 a week). 44-1580/766-599. With more than 100 houses and estates around the country, Five Star Greece prides itself on authentic experiences, whether you want Mykonos glamour or barefoot beach luxury. * Standout: On Corfu’s northeast coast, Corfu Estate House bridges the privacy of a villa (with its own jetty) and the services of a hotel (seven bedrooms; $55,613 a week). All 130 properties—most of which are scattered throughout the Cyclades, Peloponnese, and Ionian islands—are on the beach or have views of the sea. Up next: the agency is expanding to less-visited corners of the country (Patmos, Sífnos, Attica, and the Saronic Gulf). * Standout: On Corfu, Villa Aethra has two infinity pools and outdoor showers. Daily housekeeping and a private chef are included (seven bedrooms; $26,400 a week). 30-210/721-5530. This veteran tour operator has villas in Italy, France, the U.K., Greece, Portugal, and Spain, plus ski chalets in Switzerland, France, and Austria. Tapping into its extensive on-the-ground network, AKVillas organizes a range of activities—the most popular of which are in-villa cooking classes with notable chefs or local nonnas. * Standout: Casa Abelha, with its spacious, farmhouse-style kitchen, is set in Portugal’s Algarve and is a short drive from the market town of Loule (four bedrooms; $3,947 a week). 800/652-8413. Marina Gratsos lists villas throughout Europe, including Croatia, the Czech Republic, Switzerland, and Austria; most interesting are the 25 properties in her private collection. * Standout: Designed by Bulgarian architect Krastan Zapryanov, the modern Villa Gella—a retreat in the Rhodope mountains of Bulgaria—has its own spa (six bedrooms; $11,500 a week). 4-7780/700-754. With more than 500 listings, the Milan-based agency has a formidable presence in Greece, Italy, and Switzerland. Most villas have live-in managers to supervise staff and services. Dream & Charme doubles as a tour operator, so booking flights and rental cars is a seamless process. * Standout: A restored Tuscan mansion, built in the 1400’s by the Medici family, is set on a hill covered in vineyards (six bedrooms; $20,000 a week). Appeared as "Rooms for Rent" in T+L Magazine. – Who They Are: This pioneer of the sharing economy lets owners rent everything from tree houses to castles, but apartments are still its mainstay. – Best In: Barcelona, New York City, Paris. – Stay Here: A sunset-facing loft in Los Angeles’s hip Downtown arts district, with pool and gym access ($188). – Who They Are: On this TripAdvisor–owned peer-to-peer site, renters can post photos and link to Facebook to see if any friends have added reviews. – Best In: Barcelona, Paris, Rome. – Stay Here: A two-bedroom in Barcelona’s Sants area, with a well-stocked kitchen and washer/dryer ($214). – Who They Are: This Paris-only site offers a luxury-hotel experience: concierge, maid service, and limo pickups upon arrival. – Best In: Île St.-Louis and the Notre Dame district. 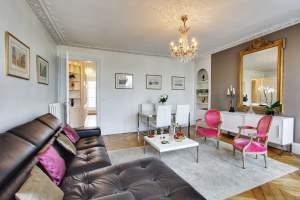 – Stay Here: A two-bedroom flat in the Fifth with a terrace overlooking the river, walking distance from the Louvre ($570). ​– Who They Are: The company has been buying up rental sites in Australia, New Zealand, and Asia. It also has a new luxury-rental micro-site. – Best In: Barcelona, Florence, New York City, Paris. – Stay Here: A three-bedroom loft in downtown Manhattan, set right above Great Jones Spa ($750). – Who They Are: A family business whose owners—a pair of sisters—personally inspect each listing. – Best In: Florence, Rome, Venice. – Stay Here: A terraced, one-bedroom penthouse in Rome’s Prati neighborhood ($214). – Who They Are: Europe’s answer to Airbnb, this German company has instant, last-minute booking (up to 8 p.m. the night before). – Best In: Barcelona, Berlin, London, Rome. – Stay Here: A three-level, four-bedroom apartmentin Amsterdam, near the central Leidseplein ($615). – Who They Are: A South America–focused group that handpicks its properties and is known for nightlife perks such as entry to private clubs. – Best In: Bogotá, Colombia; Buenos Aires; São Paulo. – Stay Here: A stylish one-bedroom with an outdoor deck in B.A.’s leafy Palermo Hollywood ($102). – Who They Are: Its curated selection of high-end apartments all come with an iPhone full of insider tips on where to shop, eat, and drink. – Best In: London, Los Angeles, New York City, Paris. – Stay Here: An antique-filled, three-bedroom Georgian home in the hip Shoreditch area of London ($377).